Posted On March 20, 2017 by Team iCynosure. It’s Monday evening and I’m in the Kitchen, addicted to trying out new recipes and experimenting with some odd combinations until they delight my flavour palate. Nope, I’m not an old bore; just a mother trying to create magic for my child. After a fun morning at the launch of a Baby Sunscreen Lotion yesterday, the rest of the day was dedicated to "how to survive the Mumbai summers". The list not only had things that I need to do and get but also to design some finger-licking summer treats for #PrincessHeer that will ensure adequate nourishment but at the same time taste amazing so I don't have to shove the food down her throat. I’ve been extremely proud of my Kitchen Experiments those which got me loads of accolades until Heer realised that food isn’t all fun to eat! Over the last few months, it has become worst and I’ve time and again looked at my fellow moms for inspiration; however very little has really worked. In the tiring times, Hershey’s came to my rescue with their Hershey’s Recipes that have a range of recipes based on ingredients you wish to use and also on your cooking skill levels. 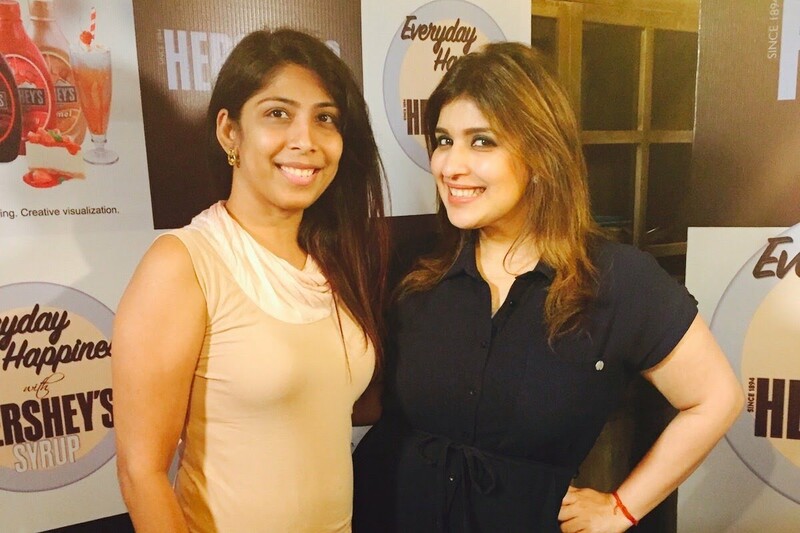 When last week the brand organised a hands-on cooking workshop 'Hershey's Cook Along’ with renowned Celebrity Chef Rakhee Vaswani I joined in to stir up some quick, fun and exciting twists to your everyday recipes. Chef Rakhee had a well thought out plan for the workshop with a simple yet interestingly line of specially curated recipes to please the little ones at home. At the Palate Culinary Studio, I got to spend some unadulterated bonding time with Hershey's new range of product and amassed some knowledge to utilise them in various ways apart from the regular flavoured milk and shakes and as bread spreads. Read up, assemble the ingredients and whip up a couple of recipes with the Hershey. Here I'm sharing two easy-peasy recipes that have become my staple go-to from the workshop. No child will refuse a chocolate bowl at any time. However, the fun here is adding some super nutritious ingredients which otherwise they will point blank refuse to eat. Chocolate Ingredients - 1 Cup Oats, 1 tbsp Dried Cranberries, 1 tbsp Chia Seeds soaked in 1/2 Cup Soya Milk, 1/4 Cup Mixed Fruits and Nuts as per choice and allergy, 1 tbsp Hershey’s Caramel Flavoured Syrup and 1 tbsp Hershey's Chocolate Flavoured Syrup. Chocolate Preparation Method - Add oats, soaked chia seeds and Hershey's Caramel Flavoured Syrup in a small pan. Stir the mixture over medium heat, bring to a boil. Reduce heat and let it simmer until oats are completely cooked. Add to a serving bowl, top it up with mixed fruits nuts. Finish it with a drizzle of Hershey's Chocolate Flavoured Syrup. Doesn’t it already sound exotic enough to bite into? It sure is, especially at snack time it is sure going to be hit with not only the kids but everyone at home. Chutney Ingredients - 4 tbsp Tamarind soaked in warm water, 2-4 Dates soaked in warm water, 1 tsp Masala Powder as desired (Chilli, Jeera, etc) and 4 tbsp Hershey’s Strawberry Flavoured Syrup. Chutney Preparation Method - Toss all the ingredients in a pan. Set aside to cool. Chaat Ingredients - 100 grams Boiled Potatoes, 50 grams Mix Boiled Sprouts, 50 grams Yogurt, 25 grams Sev, 12 Ready-to-use Paapdi, 1 tsp Masala Powder as desired (Chilli, Chaat, etc), Coriander Leaves to garnish and 6 tbsp Hershey’s Caramel Flavoured Syrup. Chaat Preparation Method - Arrange Paapdi on a plate, top it with mashed potatoes and sprouts. Sprinkle with some Masala as desired and add Strawberry flavoured chutney. Top it with Yogurt and some Hershey’s Caramel Flavoured Syrup. Sprinkle Chaat and Chilli Powder and Sev. Garnish with Coriander Leaves. If you want to try some more recipes, check the video below or head to Chef Rakhee's youtube channel. For me, my earliest memories in the kitchen are those of sitting on the counter-top helping my mom chop veggies and mix batter for pakoras. That's what I’m going to bring in with Heer in our kitchen, the new Hershey's Super Mum-Kid duo on the block to experience #EverydayHappinessWithHersheys.